Having concluded that there appears to be substantial evidence of unexplained UFO phenomena, what company would you be keeping if you were to consider the possibility of planet Earth being visited by extraterrestrial beings? Over the years, the US and other governments have adopted an official line of debunking reports and ridiculing witnesses, and this has probably turned out to be one of the most enduring and successful policies since the Second World War. Yet behind the public scepticism, many serious commentators, including many of the astronauts who have actually been into space as well as Prime Ministers, Ministers of State, senior NATO officials, senior CIA personnel and even the Vatican, have all voiced their belief in the extraterrestrial hypothesis. The following pages detail some comments made over the years. Cooper went on to state "Intelligent beings from other planets regularly visit our world in an effort to enter into contact with us…. NASA and the American Government know this and possess a great deal of evidence. Nevertheless, they remain silent in order not to alarm people. I am dedicated to forcing the authorities to end their silence (2)". Cooper has a distinguished career. He was one of the seven original astronauts in Project Mercury and was the first American to sleep in orbit and he also flew the longest spaceflight of the Mercury project. Although never involved in the Apollo missions he was involved in the early Gemini project. Cooper received many awards including the Air Force Legion of Merit, the Distinguished Flying Cross with oak leaf clusters, the NASA Exceptional Achievement Medal, the Collier Trophy, the Harmon Trophy, the DeMolay Legion of Honor, the John F. Kennedy Trophy, the Iven C. Kincheloe Award, the University of Hawaii Regents Medal and the Columbus Medal. He was a Master Mason (member of Carbondale Lodge 82 in Carbondale, Colorado) and was given the honorary 33rd Degree by the Scottish Rite Masonic body. "…. I believe that these extraterrestrial vehicles and their crews are visiting this planet from other planets, which obviously are a little more technically advanced than we are here on earth. I feel that we need to have a top level, co-ordinated programme to scientifically collect and analyse data from all over the Earth concerning any type of encounter, and to determine how best to interface with these visitors in a friendly fashion. We may first have to show them that we have learned to resolve our problems by peaceful means, rather than warfare, before we are accepted as fully qualified universal team members…." Cooper added, "For many years I have lived with a secret, in a secrecy imposed on all specialists and astronauts. I can now reveal that every day, in the USA, our radar instruments capture objects of form and composition unknown to us. And there are thousands of witness reports and a quantity of documents to prove this, but nobody wants to make them public. Why? Because the authorities are afraid that people may think of some kind of horrible invaders. So the password still is: We have to avoid panic by all means. 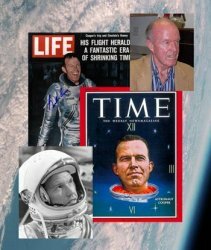 Major Gordon Cooper was a NASA Astronaut and author of We Seven. In this interview Major Gordon Cooper details a number of encounters he had with UFOs. Undoubtedly Cooper is a high calibre source and as a national hero in the United States he has absolutely nothing to gain by making false or spurious allegations of UFOs. He has gone on record, though, at the expense of his own reputation, simply because as a former astronaut he has no doubt the UFOs are very real and the matter should be properly investigated. "Also I did have occasion in 1951 to have two days of observation of many flights of them, of different sizes, flying in fighter formation, generally from east to west over Europe. They were at a higher altitude that we could reach them with our jet fighters at that time (3)."